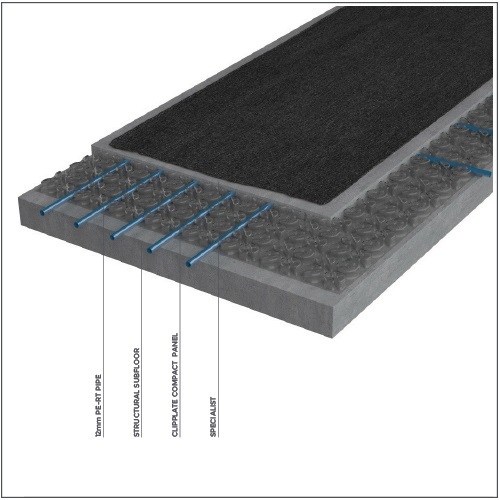 The ScreedPlate Compact panel is designed for refurbishment applications on an insulated screed/slab. The panel is 14mm thick, uses 12mm pipe, and has holes within it to allow the screed to flow within the panel. There is an adhesive layer on the underside that ensures it stays in place when the screed is being poured. The design enables very thin screeds to be poured over the panel to give the lowest possible screed build up with an underfloor heating system – just 20mm when used with Tilemaster Levelflex screed. OMNIE ScreedPlate Compact system using 12mm PE-RT pipe to DIN 4726 inserted into ScreedPlate Compact panels. Edge insulation strip to be installed around the perimeter of the room. The system to be designed, installed and commissioned to BS1264. ULTRALOW – This product has reduced build up compared to other available systems. Existing slab to meet at least SR2 (5mm deviation in 2m) requirements for floor regularity (BS8204) and preferably SR1 (3mm deviation in 2m). As a guide the heat outputs below are based on 12mm PE-RT pipe at 150mm centres with 20mm specialist screed laid over. Air Temperature = 20°C.